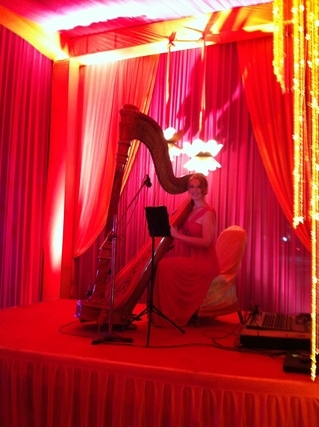 Devon Carpenter, harpist, is a professional harp player providing music for weddings anywhere in India, from Rajasthan to Delhi to Mumbai to Chennai. I have extensive experience performing both Bollywood and Western popular and classical music for weddings, sangeets, and corporate events in India. Harp services are also available in Sri Lanka, the Maldives, Bhutan, Nepal, the Andaman & Nicobar Islands, and Bangladesh. Please contact me for other destinations! The elegant music of the harp is the perfect addition to your wedding ceremony, reception, or party. In lieu of checking the harp as baggage, you may purchase a seat for it to travel with me in the cabin of the aircraft. Local harp rentra l may be available; please contact me for details.